Do you know how to respond to an interviewer who has just asked you to tell them about yourself, your weaknesses, or your accomplishments? Fall interview season is here, and employers agree that the key to interview success is preparation. Ford Library offers several new titles on career planning filled with sample interview questions and responses, advice on overcoming interview jitters and avoiding common mistakes, and practical guidance on finding a meaningful career. 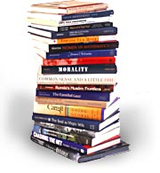 Visit our career book display or follow the links below to place your hold today. Dan Beaudry. Power ties: the international student’s guide to finding a job in the United States. Drew Tewell. The dream job program: get the job you want. 1st ed. Gayle Laakmann McDowell. The Google resume: how to prepare for a career and land a job at Apple, Microsoft, Google, or any top tech company. Gillian D. Elcock. How to get an equity research analyst job: a guide to starting a career in asset management. Heather Krasna; with a foreword from Max Stier. Jobs that matter: find a stable, fulfilling career in public service. Lily Madeleine Whiteman. How to land a top-paying federal job: your complete guide to opportunities, internships, résumés and cover letters, networking, interviews, salaries, promotions, and more! 2nd ed. Michael Farr and Laurence Shatkin; foreword by Kristine Dobson. 50 best jobs for your personality. 2nd ed. Shelly Cryer. The nonprofit career guide: how to land a job that makes a difference. Alison Doyle’s job search guidebook. Enrico Moretti. The new geography of jobs. Dalton, Steve. The 2-hour job search : using technology to get the right job faster. Ten Speed Press, 2012. The last time I applied for a job was in 1982 when the sought after technology for creating a resume was the IBM Selectric typewriter with an auto-correct feature. Typists could get away with a typo or two, since the Selectric could lift the ink off the page. While creating the perfect resume and cover letter was tedious in those days, the job search was a simple 3 step process of finding a job opening, mailing a resume with cover letter and waiting to be contacted for an interview. Today all is changed and technology makes creating the resume and cover letter easy. 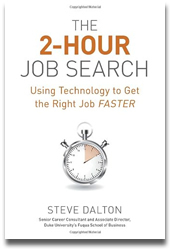 However, the job search process is far more difficult, thanks to that same technology, according to Fuqua’s own Steve Dalton in his new book, The 2-Hour Job Search. Using the internet, it is simple to find job postings and to submit resumes, but each applicant finds herself competing with thousands of others. Author Dalton explains that hiring managers are swamped with resumes and avoid reading them, relying instead on internal referrals. The challenge of the modern job search is efficiently obtaining internal referrals, or finding people to advocate on one’s behalf. Dalton describes a new way of conducting the job search that is highly efficient and effective, using technology to identify the most appropriate hiring companies for any given person and to build relationships with people inside those companies. His method involves three steps that he calls Prioritize, Contact and Recruit. He describes how to create a long list of preliminary companies, collecting information on each one and focusing on the strongest. Then he shows how to form contacts at the A-list companies, using alumni databases, LinkedIn and Facebook, and to request informational interviews. This practical book provides the job searcher with precise instructions and helpful examples on how to execute an effective job search in two hours. Author Steve Dalton draws on his extensive experience as a senior career consultant and associate director at the Duke’s Fuqua School of Business, where he is also an alumnus. Recommended to anyone conducting the independent job search. Holliday, Charles O. (“Chad”) Walking the talk : the business case for sustainable development. Greenleaf, 2002. Kross, Katie. Profession and purpose : a resource guide for MBA careers in sustainability. Greenleaf, 2009. Seireeni, Richard. The gort cloud : the invisible force powering today’s most visible green brands. Chelsea Green Publishers, 2008. 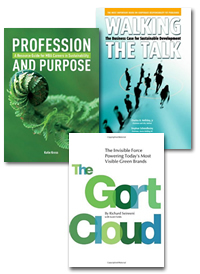 The authors of these 3 books were the opening Keynote Speaker, Strategy Moderator, and Strategy Panelist at The Duke Conference on Sustainable Business and Social Impact (SBSI), held on February 17, 2010 here at the Fuqua School of Business. All 3 of the above titles are available for check-out here in Ford Library. Just click a linked title above to request one of the books. Don’t miss other important titles in Ford Library’s extensive collection of books on sustainable development. We also encourage Fuqua users to take a look at the “Green Careers” Insider Guide at our affiliate WetFeet Career Resource site. After connecting, click the”Insider Guides” link at the page top, then “Industries & Careers General” at the left. If you’d like to suggest other books on sustainable development for our collection, please let us know! In addition to a re-branding of the site, here is a quick summary of the changes and how they will affect your use of the site. David Silverman, Harvard Business Blog author, tells you how to “Ask a (Near) Stranger for a Favor“. Make sure your email to those possible professional contacts isn’t overlooked or deleted outright. Business Monitor Online–daily macroeconomic, financial and company news and analysis on emerging and key global markets. Business Source: Alumni Edition–More than 1,350 full text business magazines and journals, of which more than 350 are peer-reviewed. Includes publications in nearly every area of business including marketing, management, MIS, POM, accounting, finance, econometrics, economics and more. Reference USA–database of directory information for 12 million US businesses that is searchable by SIC code, geographic location, Yellow Page heading, company, etc. It includes some names of corporate officers as well as contact information. GoingGlobal–an excellent resource for information on international job searches, life and study abroad, international internships, and much more. We also provide links to free or low cost databases in our alumni e-library. I came across a new blog from the Wall Street Journal this morning that may be useful for recent grads still in the job search. Laid Off and Looking follows eight out-of-work professionals as they look for new jobs in a post-meltdown world. Each writes about his or her own personal experiences with all of the ups and downs that go into a job search in a difficult market. Hat tip for the discovery to another interesting business blog: BizDeansTalk. Both blogs have been added to our blog roll. Enjoy! Broughton, Philip Delves. 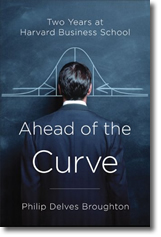 Ahead of the curve : two years at Harvard Business School. Penguin Press, 2008. In 2004, Philip Delves Broughton left his position as Paris bureau chief of the London Daily Telegraph and enrolled in Harvard Business School. In 2006, he graduated with an MBA. This book recounts the details of those two years HBS, providing details on classmates, faculty members, and the day-to-day workings at HBS. Delves Broughton is an ambivalent MBA. He applied to Harvard because print newspapers were dying and he wanted to change careers. He immersed himself into a new world, learning about valuation, negotiation and trading. He learned how to speak like an MBA, analyzing a case and making points quickly. He heard speakers like Warren Buffett and Hank Paulson. Yet in the end, he was haunted by the imagined life of a corporate drone, giving up his life to “airports and sales meetings and a paunch.” He is the only person in his section who does not have a job offer by graduation. Throughout the book, Delves Broughton describes his struggle to reconcile two things he wants: The financial security that comes with a career like consulting or banking. And a life outside of work. He is at his best when describing this struggle and the choices he makes. Knowing that there are students graduating who are still seeking permanent positions. If you are one of them, we’d like to remind you that the Ford Library can offer one-on-one assistance as well as a online tutorial. For more information, contact the reference staff at reference-librarians@fuqua.duke.edu, or call 919-660-7874. Wondering how you can locate a job in a challenging economy? create a customized list of companies using variables such as geographic location, annual sales, industry, etc. Classes will be held 1/28 through 2/25 in the Ford Library Data Resources Room. Some of the databases covered will include ABI-Inform, Factiva, MarketLine and Onesource, plus a look at Vault, Wetfeet, and others. This class is designed for students who have not taken the basic library database class. Register soon since space in the Data Resources Room is limited. Please feel free to send any questions about the class to: reference-librarians@fuqua.duke.edu.